Your reporter had forgotten to bring a pen and could not borrow one; perhaps he was not trusted to return it, which has been known to happen in the past! In any case, this report has to be from memory, which is getting predictably less reliable by the week, let alone the year. Apologies therefore for any errors of omission and commission. Unseasonably damp and cool weather greeted the guests gathering for the unveiling of the plaque to Professor Francis Hutcheson at Saintfield. 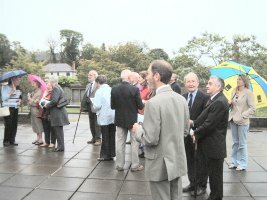 As well as the Minister, Rev James Hyndman and his wife Janice, the guests included members of the congregation, representatives of the Down District Council, Down County Museum and the Friends of the Museum (who sponsored the event), Saintfield Heritage Society and the Ulster History Circle (who provided the plaque). Because of the weather, the unveiling ceremony, by Mrs Janice Hyndman, was necessarily brief and the company adjourned to a large function room in the church. Mrs Elsie George, Chairperson of the Saintfield Heritage Society, introduced the speakers. 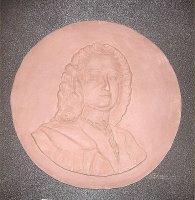 Rev Hyndman described how much Prof. Hutcheson had influenced the liberal views of many Prysberterian Ministers in the late 1700s, including Rev. Steel Dickson, Rev James Porter and his predecessor in Saintfield, Rev Thomas Ledlie Birch. 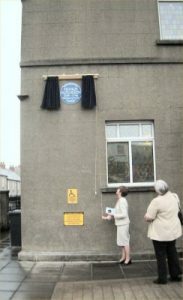 Dr James Hawthorne outlined the origin and objectives of the Ulster History Circle and described some of the often lengthy processes that were needed to erect a plaque. Unlike its counterpart in England, English Heritage, which had a budget of £200,000, the Circle had no budget and depended on sponsorship such as that provided by the Friends of Down Museum in the present case. Philip Orr, Head of Theatre Studies at Down High School, spoke about the life Francis Hucheson and about the wide influence his published thoughts had on a great number of the seminal figures of the late eighteenth century, Hume, Smith, the United Irishmen, and the framers of the American Constitution. Mr Orr knew his subject and spoke with authority and passion. It was noted that his one man play “The Final Words of Thomas Russell” was being performed by actor Will Irvine in Down Museum next week and again in September. 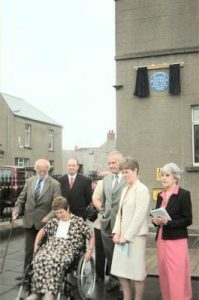 Miss Enid Minnis, President of Saintfield Heritage Society, described the origin and development of the Society. 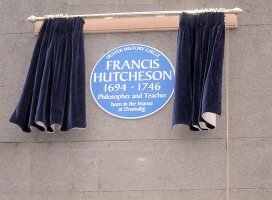 She mentioned that one of her tasks in the early days of the Society was to contribute an article on Francis Hutcheson. She urged anyone interested in the Society to join. Ken Dawson, Chairman of the Friends of Down Museum, said how delighted he was that the Friends was able to sponsor the event. The mission of the Friends was to engage the public to bring a knowledge of our heritage to a new generation and to help with the development of local societies. He commended the Friends to those present and suggested that those not already a Friend should consider joining. Mrs Elsie George thanked everyone for their attendance and the speakers for their contribution to what was a historic event in giving recognition to a local man of great importance.